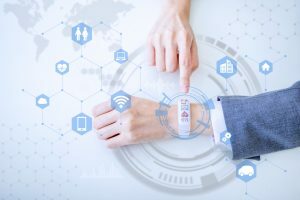 Wearables Industry to Top $27B in 2022 | HOBI International, Inc.
Worldwide smart wearable device sales will double by 2022, becoming a $27 billion market with 233 million unit sales, according to a report conducted by industry analyst CCS Insights. The market information provider states that the growth is being powered by smartwatches, with fitness trackers on the slide in the next four years. The CCS’ report states that 85 million smartwatches will be sold in 2019, increasing to 137 million in 2022, but that sales of fitness trackers will drop by 43 million this year to 39 million within those four years. Of the 117 million smart wearable devices the analyst expects to ship this year, Apple will lead the way thanks to its popular smartwatch range. The latest Apple Watch – the fourth generation – launched last month and CCS claims that it is a main driver in smartwatch adoption and subsequent interaction. A recent survey suggested nine out of ten smartwatch owners rely on their connected timepieces on a daily basis. “The combination of Apple’s success with its Watch and the high engagement levels we’re seeing among smartwatch owners reflects the value people are now placing on these products,” explained CCS Insight’s senior analyst for wearables, George Jijiashvili. “It’s a step change from a few years ago, when we consistently saw high levels of abandonment from early smartwatch users, who quickly became disenchanted with initial products”. “We’re hugely encouraged that established watchmakers such as Fossil are betting their future on a wide range of smartwatches for several fashion brands such as Diesel, Michael Kors and Skagen, and premium watchmakers such as Louis Vuitton, Montblanc and TAG Heuer continue to invest in this area,”Jijiashvili commented. However, according to CCS, a big boom for the wearable market over the next few years won’t be coming from the wrist. The report states that the ever increasing array of ‘hearable’ (i.e. smart connected headphones and earphones) will surpass 27 million shipments by 2022. Jijiashvili said, “We’ve seen some excellent products in this area over the past year from companies like Samsung and Sony. It’s only a matter of time before Apple adds more functions to its AirPods, which will see them fall into our definition of smart hearables. If this happens, Apple could kick-start this device category like it shook up the smartwatch market with the Apple Watch”.